People can get obsessed with romance, they can get obsessed with political paranoia, they can get obsessed with horror. It isn't the fault of the subject matter that creates the obsession, I don't think. You didn’t ask, but I’m telling you anyway. I’m in love with scarves. Love to the point of obsession. See the below photo if you don’t believe me. I know it’s harmless…but I do wear one almost every day, and now that they’ve got the office nicely air-conditioned for summer, it’s practically mandatory. Glorious! The collection right now is 16 strong, but only because I recently gave four away. Uh huh. Maybe I have a slight problem? 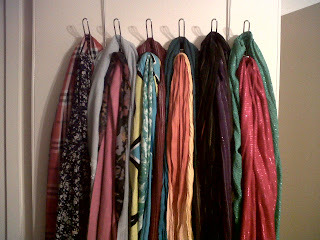 Photos are my own, and I bought (or was given) all of the scarves. 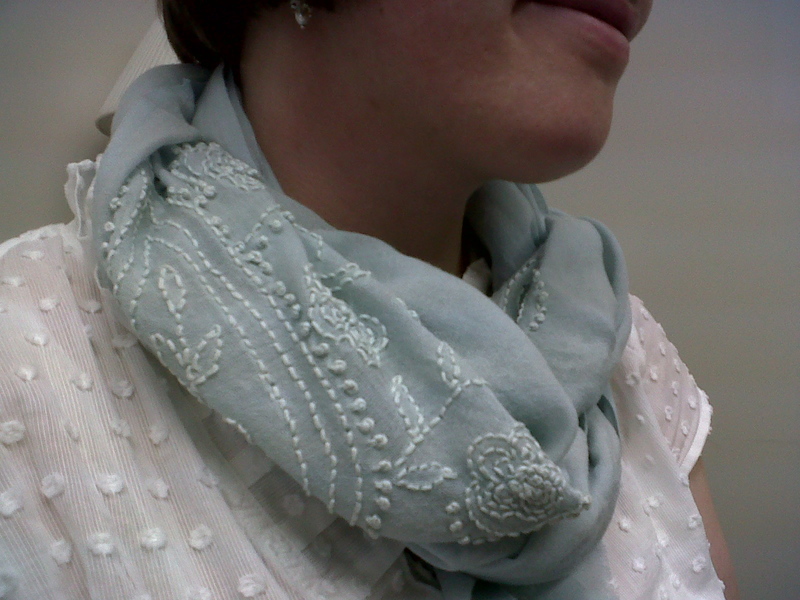 Oh, I've just recently begun a love affair with scarves! So much more than an accessory, they are a statement of your personality, wouldn't you say? The picture of the first one is gorgeous! Love the one in the picture. I agree-scarves are the new thing and they are so useful and lovely at the same time. I have about 10 myself!! dang it, i should've gone to the clothing exchange after all. i love scarves! Oh me too. I love all kinds from vintage retro itty bitty ones to long glorious winter ones. I'm a huge fan.